The Honourable Robert J. Sharpe, a judge of the Ontario Court of Appeal, outlined the history of a landmark case in Canadian constitutional law during City’s Spring Lecture series. On March 9th 2016, Judge of the Ontario Court of Appeal in Canada, The Honorable Robert J. Sharpe, gave his audience a riveting outline of the landmark 1929 Persons case which altered the course of Canadian constitutional law. 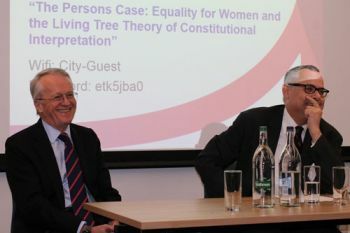 Judge Sharpe delivered the second lecture in The City Law School’s Spring Lecture Series, titled “The Persons case: Equality for Women and the Living Tree Theory of Constitutional Interpretation”. 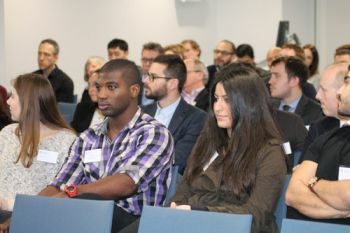 The lecture was chaired by Judge Sharpe's former student, Dean of The City Law School, Professor Carl Stychin. In the Person’s case, England’s reformist Lord Chancellor, John Sankey, ruled that women were eligible for appointment to Canada’s Senate. The case was initiated by Edmonton judge, Emily Murphy, and four activist women. It challenged the exclusion of women from Canada’s upper house and the idea that the meaning of the constitution was incapable of being changed over time from the original intention of its framers in 1867. Judge Sharpe effectively conveyed the social and political context of the lives of the key actors of the Persons case to his audience. These figures were Murphy, Nellie McClung and other members of the ‘famous five’, politicians opposed to the appointment of women, lawyers arguing the case and the judges deciding it. Importantly, the audience learned about Lord Sankey’s description of the Canadian constitution as a ‘living tree’ which could no longer be viewed as fixed and unalterable but needed to be treated as a document that was “in a continuous process of evolution”. He has written many books and scholarly articles and has reported judgements as a trial and appellate judge in a wide variety of areas. He has also appeared as counsel before courts at all levels, including the Supreme Court of Canada. Justice Sharpe is a frequent lecturer at continuing education programs for lawyers and judges. He also lectures at many Canadian and international universities. Judicial Interpretation is a mode or technique that explains how the judiciary should interpret the law, specifically constitutional documents and legislation. There are several approaches to this, including these: the structuralist approach, doctrinalist approach, developmentalist approach, textualist approach, contextualist approach, and the originalist approach.